I love this snack! I came across variations of this recipe today and thought it was definitely a great guilt free snack to have stored away ready to be eaten in between meals or added to your favourite salad. Most of the recipes added honey and sugar to the topping, however as i am trying to cut out all things sweet i thought i would try without these two ingredients! Heat fan forced oven to 180 degrees and line a baking tray with baking paper. 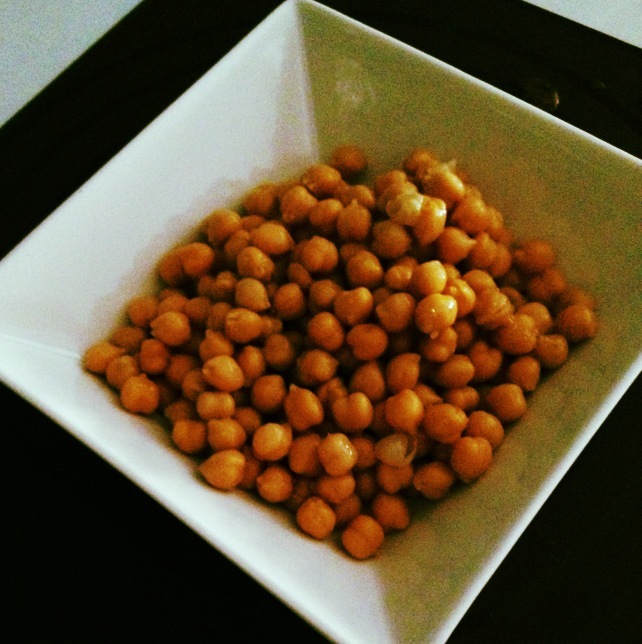 Drain and wash chickpeas, pat dry with paper towel to soak up any excess water. Place chickpeas into a mixing bowl, tossing through melted butter, cinnamon and salt until thoroughly coated. Spread chickpea mix onto baking tray and cook until crunchy for 40 minutes to an hour (depending on oven). Allow chickpeas to cool for 20 minutes after cooking. This healthy snack can be stored within an air tight container for up to 4 days.